Image caption Birmingham City Council says the new Curzon street station needs to "rival the best in world" in it's design. 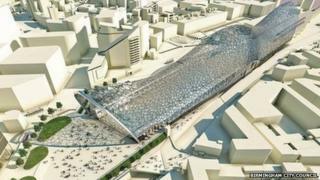 Plans for a new HS2 railway station in Birmingham need to be more ambitious, the city council has said. The authority said HS2 Ltd's current proposals for Curzon Street Station do not promote growth and regeneration in the city enough. It wants better road and rail links between the high speed line and the West Midlands. HS2 Ltd said it was understandable the council wanted a say, but believed the plans "struck the right balance". The council and other interested groups submitted suggested changes to the scheme on Friday. Council leader, Sir Albert Bore, said he wanted to get the "maximum benefits possible from HS2". The council said the new Curzon Street Station, the main HS2 station in Birmingham, could bring significant benefits to the area, but needed to look more impressive and "rival the best in the world" in its design. It also said the proposed interchange station near Birmingham airport, needed to be more than a standard "parkway" station, have better transport links with the local area and a people mover to airport itself. Image caption The former LDV site at Washwood Heath is set to become a train maintenance yard. The plans for HS2 include proposals for a train maintenance depot at Washwood Heath, but the council said the current plans do not make maximum use of the area and wants more land set aside for businesses. More needs to be done, the council said, to support and compensate homeowners and businesses affected during the construction. The council said it could not put a figure on the cost of all these changes. Ben Ruse, HS2 lead spokesperson, said: "We welcome the continued strong support of Birmingham City Council and are confident we can work together to agree the right solution for Curzon Street and the Birmingham Interchange."